What to do when your HOA bans vegetable gardens in your front yard? Rally your community, state your case and keep on growing your own food! "The board isn’t saying you can’t have a garden, they are just saying you can’t have it in your front yard." Below was my "Letter of Appeal" to keep our garden in the front. I am hopeful they will no longer ban it because several moms in neighborhood supported me in presenting this case at a recent board meeting. Their response was encouraging and we haven't received any further citation since then! My name is Nicole Schauder. My husband David and I and our children have lived in Trumpet Circle for over 10 years. Around 5 years ago, we started gardening in order to grow our own food. This gardening project, while at first recreational, quickly grew into a serious endeavor for us. We were desperately trying to search for alternative sources of organically grown, nutrient-dense produce. We thought, there must be something wrong with the commercial food that we were buying. Especially, the food that was not organic. Perhaps if we grew our own fruits and veggies, it might heal our children from their allergies. When our first child was 18 months old, she was diagnosed with "failure to thrive." This was due to the fact that she was allergic to wheat, legumes, tree nuts, beef, chicken, eggs, milk and other dairy products. Our second child, similarly, suffered from allergies that included fish and nuts. One evening when he was 3, we fed him tilapia for dinner. Shortly after eating the fish he turned blue and could not breathe. We gave him Benadryl (we had no Epi-Pen for him then) and called the paramedics. The only foods they could safely eat with the exception of legumes and nuts were vegetables and fruits. 5 years ago, we had fewer organic food choices in the market than we have today. As we began researching our food, we discovered that commercially-grown food even if it is organic travels long-distances to get to the stores and loses valuable nutrition in the process. When these fruits and vegetables finally hit the shelves of our grocery stores, organic options are more expensive than their non-organic counterparts. The more we studied about intensive, organic vegetable gardening, the more we tried to apply our knowledge to our backyard garden. But since our property faces the south, we discovered that planting in our front yard (Year 3) greatly increased our fruit and vegetable yields. The results were much more effective than planting in our backyard. Plants need sunlight to grow more vigorously. This is the reason why we started to plant edibles in our front yard. Eventually, we became certified in permaculture designers. Permaculture is a sustainable design system based on ethics that gives a holistic approach to organic gardening. Basically, it helps you consider your garden, not merely in isolation, but as part of many circular ecosystems: home, family, local wildlife and pests, community and the larger society. And it works with nature, not against it. So when we design with permaculture in mind, we design our gardens and homes taking into consideration not only our own personal goals for health, wellness, aesthetics, and recreation, but that of a larger whole of our community and for the long-term ecological benefit of mankind and the planet. 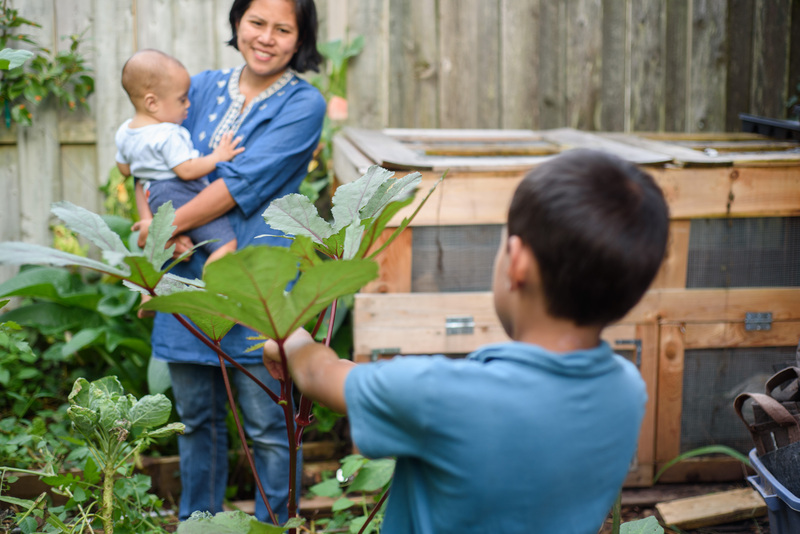 Our family business is Permaculture Gardens (www.growmyownfood.com), an education website that is passionate about helping suburban families grow their own food! As already mentioned, we experienced health benefits by being able to grow and eat our own food. In the summer, more than 25% of our food consumption comes from our garden. Since we started eating organic and from our garden, our two eldest children have outgrown all their previous allergies except for most nuts. This is a tremendous burden that has been lifted off our shoulders. When we first found out that they were allergic, we had to ban certain foods from our home, learn how to cook allergy-free and discover where to source our foods. Now, the only thing they have to watch out for is nuts. Our bottom four children were born with no allergy conditions. This was an amazing relief for us! Since we started growing our own food, our own digestive disorders have been healed. My husband used to be more prone to "food poisoning" and now that is a very rare occurrence for any of us. Even though we are considered a very large family of 8, we do not get sick as often as we used to 5 years ago! Our food tastes better. We've only discovered how fresh figs taste vastly different from store-bought ones. The same is true of tomatoes. No two tomatoes in our garden seem to taste alike. "I am racking my brain to figure out what it tastes like and there's nothing I know that I can compare it with. I cannot figure it out. And yet, it's good!" Golden Health Pharmacy, this was again the same reaction. "I have never tasted anything like this. But it tastes good!" The same is true of fruit grown in neighboring gardens. Our neighbor, Aklima, who lives two-doors to our right just gave me a Bangladeshi pumpkin to eat and to save seeds from. What a sweet and delicous pumpkin that was, quite unlike anything I've had from a grocery store. Aklima gardens the same way she does in Bangladesh, by using twigs as trellises for her vines. Speaking of friendships, we've started many conversations and forged many friendships because of our front yard. We have helped build other gardens on Trumpet Circle and in the community. We have given away tomatoes, herbs, squashes, and pumpkins to our neighbors left and right to us. Aklima shows me how to properly cook Bangladeshi squash. I give zucchini bread or sweet potato muffins to Mr. Denny Rucker on my right and hordes of tomatoes, squash, fig, cherry, pawpaw fruit (the largest native American fruit) to my neighbors on my right Ms. Sedia Asgarian and Aklima, the Bangladeshi grandmother featured above. Aklima speaks no English, we only speak through the language of farming. Down the road on Leatherleaf Circle, a Vietnamese gardener named Wei brought us dates from her date tree which we readily turn into a delicious Chinese date butter. In exchange, we gave her rosemary and she gave us Thai sweet basil seeds for next summer. Chinese dates or jujube from our neighbor, Wei. On Leatherleaf Drive, Suzuki violin teacher, Nicole Fainsan asked us to design and help install her backyard because vegetables are a key component of her healthy diet. 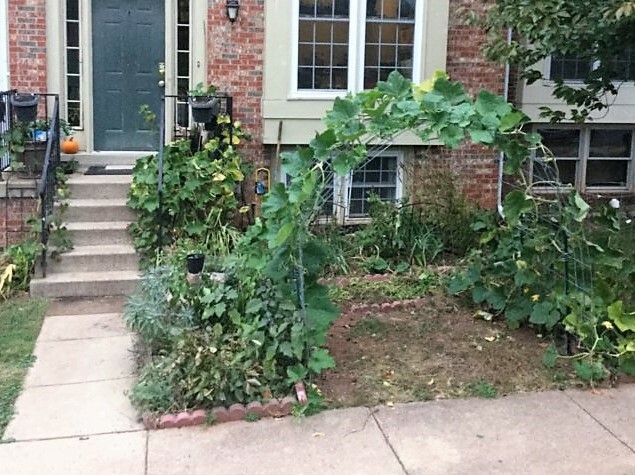 An initial investment of one day of hard labor turned into a seemingly endless summer of squash, basil, herbs, sweet potato and beautiful gigantic sunflowers for Nicole. The pictures from her summer garden can be found HERE. On Trumpet Circle, when French neighboring mom Awa came for a visit, she left with a parting gift of fresh sage, rosemary, and thyme for her dinner. Also on Trumpet Circle, our good friend, Sandy was so happy when I showed her how to revive her Guatemalan "chiltepe" chili pepper: A plant snuck in from her homeland by an uncle. Sometimes chiltepes be as hot as jalapenos, sometimes mild as white pepper. I dried them and use them as peppercorns. As you can see above, These peppers are not only edible but beautiful plants! She also tells me that back home in Guatemala they use fig leaves to cure cough ailments by boiling and steaming the fig leaves in water. I learn so much from this form of “cross-pollination” of garden and food knowledge from my neighbors. We have opened our home to group tours via MeetUp in order to inspire other homeowners in the Northern VA area that one can grow 200 lbs of produce on a piece of land less than 1/27th of an acre! We've conducted live workshops in our home or the local libraries as well as online webinars which we hold on a myriad of permaculture topics. Recently, we have been in touch with the Asst to Supervisor Koran Saines, Jacqueline Pujol regarding the design and selection of a site that could potentially serve as a community garden for the Sterling area. Most inspiring for us, we started and continue to maintain a permaculture garden in the courtyard of Rolling Ridge Elementary School. We teach an after-school eco/gardening club for students K-5 and through the help of administrators, parents, local landscapers, 2 boy scout troops and several different teachers, a grant from the Whole Foods Foundation as well as the Jane Goodall Foundation and volunteers, we have sustained our school garden club these past 3 years. The gardens at Rolling Ridge has been a collaborative community effort that directly serves several of the families who live in and around Fox Creek. And all of this as a result of us growing an edible organic garden in our front yard. Rodents are definitely a health hazard so we have "rodent-proofed" our backyard garden compost with a mesh grill. Our 4ft X 4 ft double compost bin system has a metal mesh that prevent entry on all sides even the bottom! We compost any rotting vegetables immediately. Our compost can get up to 170F even in the winter and that kills all bad bacteria as well as rodents. We intentionally chose plants that would deter pests. In the front, we have rodent-deterrents in the form of herbal aromatics like mint, lavender, thyme, parsley, sage, and oregano. We also encourage the Trumpet Circle cat, "Pumpkin" to linger at our doorstep. There are only some of the natural pest control devices we use. We have given an entire webinar on essential oils as natural pest deterrents located on this link. We also are aware of other natural rat traps and bait. Since rodents (including squirrels) cannot burp, they implode when they eat baking soda. Baking soda hidden in flour and sugar is often an effective trap for killing rodents. The main attraction for rodents is the garbage that people put out a day too early. After hosting a webinar on "Going Zero Waste" with an inspiring young woman who had kept her waste to the size of a Mason jar for the last 6-months, we have become a "going zero-waste" family. Currently, we only put out one trash bag (in a can) per week on Tuesday mornings. We have extensively reduced our trash and we hope to do even more. We also have other natural, non-pesticide techniques for managing animals other than rodents. How does our front garden impact the environment? Pawpaw fruit from trees in our backyard. These are the largest native fruit in North America and their taste like a cross between a mango and banana. Since the installation of our front yard, we have seen the return of the American Goldfinch to our area. These yellow birds are the strictest of vegetarians and love to feed on our blooming echinacea flowers (both medicinal for humans and food for birds) which we planted in our front yard. Our Concord grapevine cools our red brick wall in the front from the direct sunlight that occurs during the summer months. The grape leaves are a Middle Eastern delicacy which we have used to make dolmades with. Unfortunately, the grapes this year were sour! However, we are hoping for a better yield next year. Meanwhile, its cooling effect has helped us decrease our air conditioning needs in the summer. We plant milkweed in our front garden. The endangered monarch butterfly relies on milkweed for its sustenance. There is a concerted effort across the country to plant milkweed and thus, to "Save the Monarchs." We have also spotted the Zebra Swallowtail butterfly which is the only other pollinator for our pawpaw trees. At the HOA meeting, you asked me to speak about fulfilling my responsibility as a homeowner to ensure that my front garden is aesthetically pleasing and well-maintained. You will see in the picture attached that we have very dutifully trimmed the browned leaves. We have also raked the leaves from our neighbor’s yards. We promise to continue to maintain, prune, harvest, prevent rot and keep our garden as beautiful as possible. Currently, we do not have anything growing on the trellis as it is winter. We were planning to decorate it with evergreen long wreaths for Christmas. If you find our front yard unmaintained, let us know immediately so that we may rectify the situation as soon as possible. We tend to our gardens every single day. We use a "cottage style" aesthetic with minimal borders and lawns. I have also taken a short-course on garden aesthetics. Thanks to that course, my front yard design has been featured in the Hall of Fame designs of English garden designer, Rachel Mathews. Thank you so much for taking the time to read this and considering the reasons we have given to allow us to grow fruits and vegetables as we would like. Like what you're reading? Sign-up for our bi-monthly newsletter and start growing your own food in the front or backyard!